This incident was a military encounter in which Russia annexed the Panjdeh district (now part of Turkmenistan) and the superior Russian were pitted against the 500 defending Afghan soldiers headed by Afghan officer Ghausiddin. The Russians had subdued the Khanate of Khiva in 1881 – completely massacring the 6,000 defenders of the Tekke Turcoman fortress of Goek Tepe – and then advanced to the Oasis of Merv in 1884. In early 1885, the Russian army - fresh from the conquest of Merv - struck at the Panjdeh Oasis just north of Herat, defeating a brave defence by a smaller Afghan force. The pastoral Turkmen who inhabited the Panjdeh had pledged allegiance to the Amir in 1882 and agreed to pay a tithe (‘ushr) as revenue. Dependent, as it had been for centuries, on Herat and Maymana, a subgovernor (hakim) was placed in charge of it and a military contingent stationed there. With the Russian advance against Panjdeh, many elders from Central Asia arrived at the Amir’s court and promised him that should he declare a jihad against the Russians, the whole of Central Asia would rise with him to throw off their yoke. He did no such thing, however, and ordered his troops to withdraw once the Russian advance became fact. The Amir had, since 1881, called on Britain to settle the matter of his northern boundaries with Russia and had, again and again, warned of the Russian advances in the region – but to no avail. When, on March 30, 1885, Panjdeh fell to the Russians, a crisis ensued. Britain – in line with its promises to the Amir – informed the Russians that the attack was considered a threat to British interests and any further advances would be considered a declaration of war. The occupation was completed in 1886 and Britain’s promises to the Amir proved hollow. The fact that Britain did not come to Afghanistan's defence , as she was obliged to do in case of unprovoked Russian aggression , confirmed the Afghan ruler in his belief that he could not rely on British promises of support. 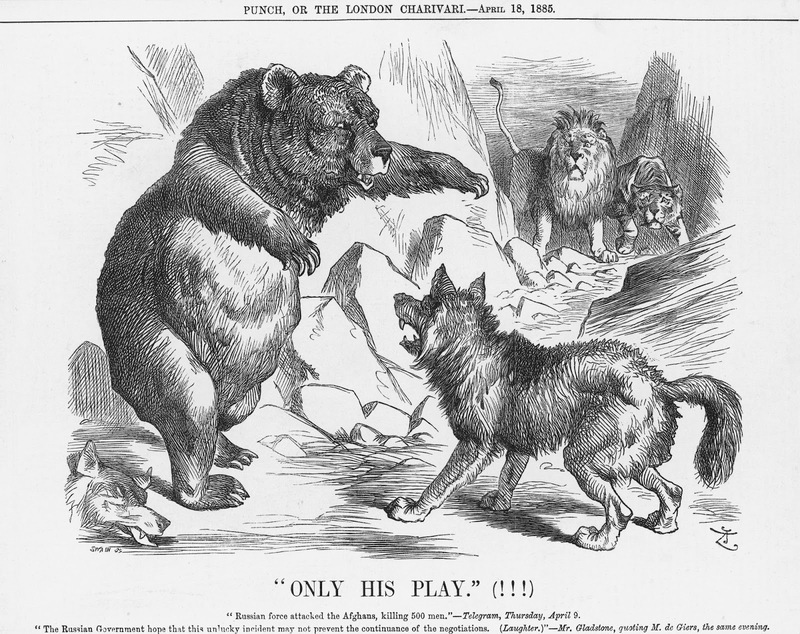 Great Britain and Russia in Confrontation over the City of Herat, Afghanistan ("The Fight's Off--(For the Present)"), 1885. 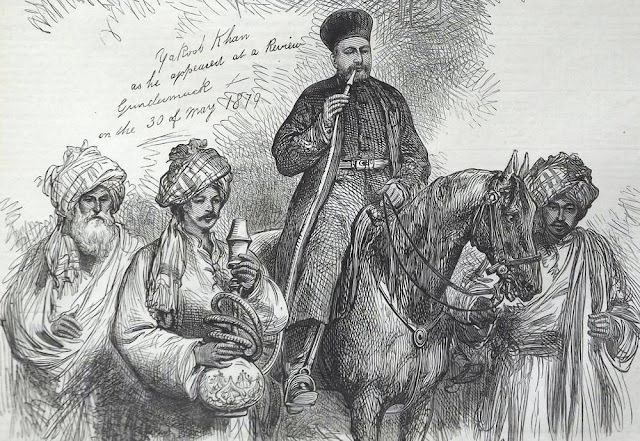 An illustration from a British newspaper depicting Panjdeh incident (1885). 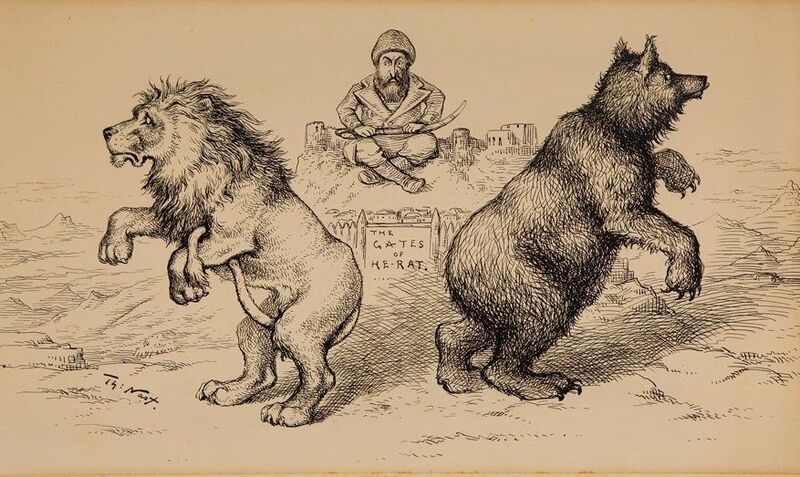 Bear (Russia) is attacking Wolf (Afghanistan), and, Lion and Tiger (British India) is looking at them from distance.